This example uses the hinfstruct command to tune a fixed-structure controller subject to H∞ constraints. The hinfstruct command extends classical H∞ synthesis (see hinfsyn) to fixed-structure control systems. This command is meant for users already comfortable with the hinfsyn workflow. If you are unfamiliar with H∞ synthesis or find augmented plants and weighting functions intimidating, use systune and looptune instead. 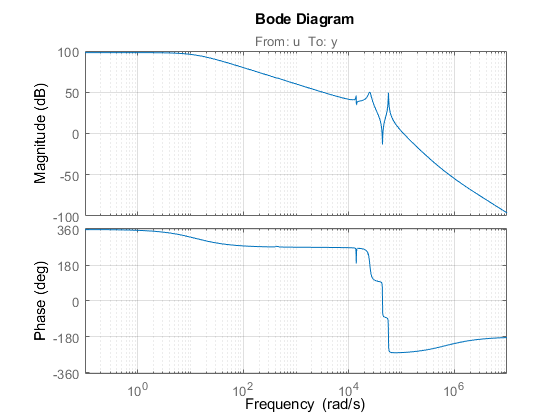 See "Tuning Control Systems with SYSTUNE" for the systune counterpart of this example. This example uses a 9th-order model of the head-disk assembly (HDA) in a hard-disk drive. This model captures the first few flexible modes in the HDA. We use the feedback loop shown below to position the head on the correct track. This control structure consists of a PI controller and a low-pass filter in the return path. The head position y should track a step change r with a response time of about one millisecond, little or no overshoot, and no steady-state error. Use the tunablePID class to parameterize the PI block and specify the filter F(s) as a transfer function depending on a tunable real parameter a. 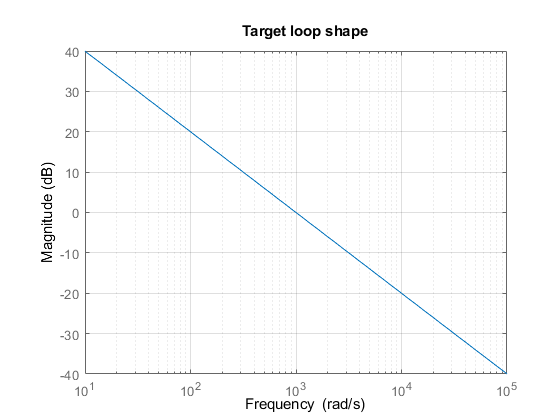 Use the target loop shape LS and its reciprocal to filter the error signal e and the white noise source nw. 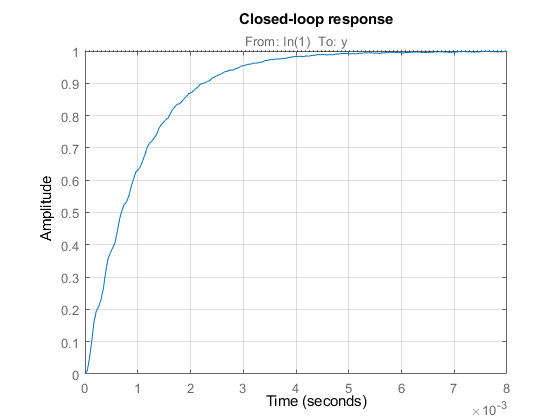 The closed-loop step response has small overshoot. We can therefore focus on tuning C(s) and F(s) to enforce ‖T‖∞<1. 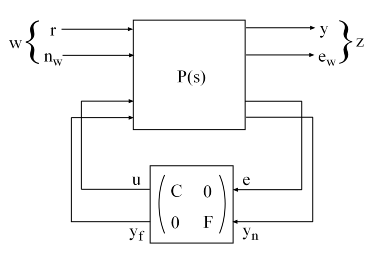 Note that T0 captures the following "Standard Form" of the block diagram of Figure 2 where the tunable components C,F are separated from the fixed dynamics. 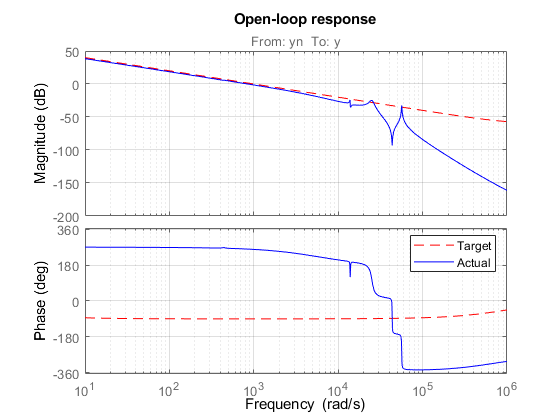 While the response has no overshoot, there is some residual wobble due to the first resonant peaks in G. You might consider adding a notch filter in the forward path to remove the influence of these modes. 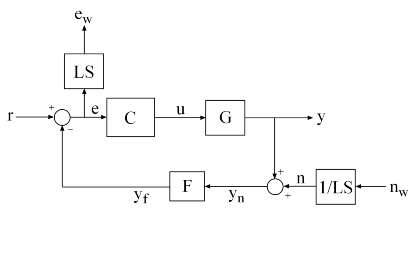 Suppose you used this Simulink model to represent the control structure. If you have Simulink Control Design installed, you can tune the controller gains from this Simulink model as follows. First mark the signals r,e,y,n as Linear Analysis points in the Simulink model.